Native American traditional medicine has long included osha as a remedy for many conditions. Learn about its interesting history and potential health benefits. Osha is sometimes referred to as "Porter's licorice root," "bear root," or "chuchupate." These names have been attributed to the plant over the years by those who have used it to benefit from its medicinal features. Since osha only grows at high elevations - typically 9,500 - 11,500 feet (2,900 - 3,500 m) above sea level - the traditional knowledge of the plant has been procured mostly from mountain dwellers of western North America and northern Mexico. Some historic schools of Native American medicine regard osha as a useful and valuable herb that is helpful in treating a wide range of conditions. Likewise, traditional Hispanic American and Mexican lore proposes similar ideas. Some scientific research has been carried out in order to confirm if and how the plant is advantageous to health, but further investigation is required to determine if all of its uses are valid. Lowering blood pressure. Osha contains a substance that can dilate blood vessels, allowing better blood circulation, thereby reducing pressure. Reducing congestion. Properties of the plant can alleviate congestion caused by irritation or inflammation of the nasal passages and sinuses. Osha is considered particularly helpful for sinus headaches, and its root has also been traditionally used as a remedy for cramping, indigestion, fevers, and stomachache, as well as for preventing infections in open wounds. The part of the plant believed to be the most medicinally valuable is its root, in which many phytochemical compounds - such as alkaloids, sterols, saponins, lactones, phthalides, pinenes, furocoumarins, sterols, and volatile oil - have been identified. Phthalides have shown, among other biological activities, sedative and antispasmodic effects that are able to reduce the levels of "stress hormones" that cause blood vessels to contract, thereby allowing easier blood circulation and stabilizing blood pressure. In this way, osha can prevent a multitude of serious health conditions, such as heart attacks and strokes. The spasmolytic and sedative activities of the phthalides Z-ligustilide, tokinolide B, and senkyunolide F may also correlate with some of the uses of osha in traditional folk medicine for the treatment of gastrointestinal ailments. In addition, osha contains monoterpenes, which are the main constituents of essential oils in plants. These substances are thought to be responsible for the herb's anti-inflammatory activity. They are able to reduce swelling in mucous membranes, which helps to clear the nasal passages. Monoterpenes are also somewhat antimicrobial, which is possibly the reason why osha has been found to be effective in preventing and treating skin wound infections. Eucalyptus, myrtle, and mullein are herbs with decongestant properties, whereas ginkgo and gotu kola also promote vascular health. It is generally believed that osha is safe to be used for topical application and moderated consumption. There are no contraindications with other medication; however, those taking prescribed drugs for serious conditions should always speak with their physician before introducing any supplement to their diet. It is not known whether osha is safe for women who are pregnant or breastfeeding, and so it is recommended that they avoid use of the herb altogether. If harvesting osha in the wild, it is extremely important to be sure that it is not in fact hemlock, as both herbs look similar and can be easily confused. 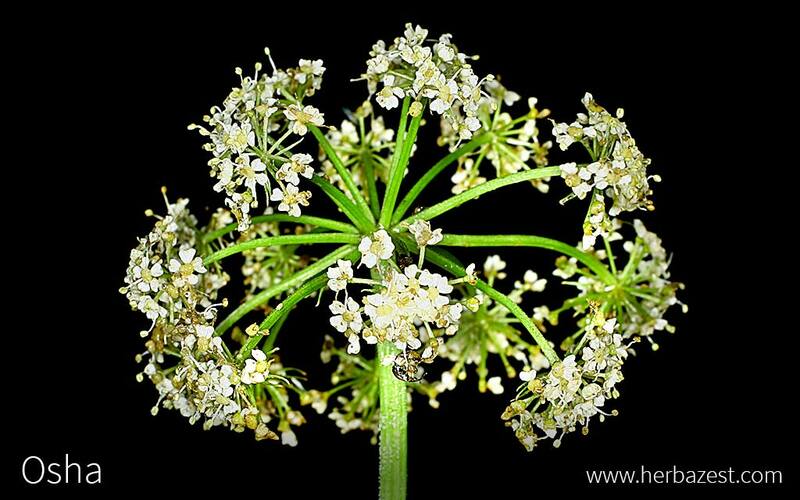 Hemlock is highly poisonous and can even be fatal when consumed. Osha will not be found in the majority of kitchens across the world, but it remains somewhat popular among advocates of traditional Hispanic and Native American medicines. Herbalists recommend it in various preparations, consisting of fresh, dried, and processed supplements, depending on the condition the user is seeking to address. These are usually made from osha root only, as this is the component that contains the most medicinal properties. Raw. The whole plant, including its seeds, can be used to season meats or dishes like chili; it is said to possess a strong flavor, similar to celery and parsley. The leaves can be added to salads or boiled and eaten as part of a larger meal. The roots can also be eaten raw or cooked, and are sometimes added to soups. Infusion. Fresh or dried roots can be steeped in hot water to help clear the airways. Capsules. These are recommended for treating coughs and colds, as well as high blood pressure. The medicinal compounds of the herb are sometimes of a higher concentration in this form than in others. Essential oil. Essential oil can be extracted from osha, which can be diluted and applied topically to cuts and wounds at risk of infection. Tincture. Crushed roots are added to a solution of alcohol, which acts as a carrier substance. Two or three drops should be diluted in a glass of water for relieving headaches. This preparation has a long shelf life if kept in cool, dark place. Osha grows at a high altitude, and therefore, it is not easily accessible to those wanting to harvest it for personal use. Having said this, thanks to the demand of modern consumers, many herbalist companies now sell the plant. It can be found online and in specialized health shops, but dried preparations remain more common than fresh. The most popular osha supplements are tincture, capsules, and oil, which are available to buy from alternative health shops and herbalist websites. However, it is possible to prepare osha tincture and oil at home from fresh or dried plants. It is nearly impossible for most people to cultivate osha for personal use, because it grows at elevations of 9,500 - 11,500 feet (2,900 - 3,500 m), although it also can be cultivated at 7,000 feet (2,100 m). Other than this requirement, the plant is considered hardy, as it can thrive in different weather conditions and does not need human maintenance. Osha will grow best when the seeds are sown close together, as their roots will intertwine to form a large, tangled mass. This arrangement offers added support for the plant as it grows. Although osha will tolerate dry soil, the ground should preferably be kept consistently moist but also of a structure that allows adequate drainage. This will permit the plant to develop to its best potential. The optimum soil is rich and fertile, but osha will grow in most types, as is shown by its existence across such a vast area from Canada to Mexico. The ideal position for the plant is one in partial shade. It is usually subjected to this environment in its natural habitat on mountains, where it grows among tall trees and other shrubs. Small white flowers will bloom in mid to late summer, usually between May and August. These develop at the top of the erect stalk. More detailed information about growing osha can be found in the herb garden section. Osha, or Ligusticum porteri, is a perennial herb native to the Rocky Mountains and other highlands spanning from northern Mexico to southern Canada. On average, it will grow to around three feet (90 cm) in height, with a spread of approximately two feet (60 cm). Thin stems grow from the stalk, and a mass of spiked leaves develop from these. In late summer, flowers will bloom in a cluster at the top of the stalk; these are cream or white and consist of around five petals, each around 0.08 - 0.2 inches (2 - 5 mm) in diameter. This collection of flowers is known as an umbel - reminiscent of the word umbrella - which indicates the overall shape. Osha belongs to the genus Ligusticum, which is in the Apiaceae - or Umberlliferae - family. This is sometimes referred to as the carrot family. Interestingly, this group also includes parsley and celery, which many people believe have a similar taste to osha. The genus Ligusticum consists of 58 accepted species, and at least 10 of them are used medicinally. Such is the case of L. acuminatum, L. acutilobum, L. chuanxiong, L. jeholense, L. mutellina, L. officinale, L. porteri, L. sinense, L. tenuissimum, and L. wallichii. Despite the fact that they have similar features, hemlock (Conium maculata) and water hemlock (Cicuta maculata) are completely different species and belong to different genera. The parsley-looking leaves of the above poisonous species make them very difficult to distinguish from osha. Due to the particular growing conditions of osha, mostly in the wild and at high altitudes, few naturally-occurring varieties have been identified. L. porteri var. porteri grows in Arizona, in moist areas of mountains and coniferous forests; while L. porteri var. brevilobum has been recognized in Nevada. There are not registered subspecies of osha. Native Americans coined the term "bear root," seemingly because they had seen bears eating the plant in order to benefit from its medicinal properties. This is said to be the reason why they discovered its potential to be used in various health remedies. It is believed that "osha" is an old Northern American word for bear, and "chuchupate," an ancient Aztec word, has the same meaning. Owing to the plant's Native American history - particularly in relation to the association with bears - some spiritualists use osha in meditation and rituals. It is believed that by focusing on the roots, the plant can help people who are struggling with internal demons to find their inner strength. Because osha is so difficult to cultivate on low land, the plant is often considered endangered. It is grown for commercial use, however, and in 2010, it is estimated that herbalist companies harvested almost 4,800 pounds (2,200 kg) of root, which was used to produce various health supplements. The main consumers of such products are the U.S., Japan, and Germany. Because of its distinct growing requirements, osha is not commonly found across much of the world. This means that only selected and avid herbalists will prescribe it to their patrons. Traditional Hispanic and Native Americans maintain that it can be useful to remedy a range of conditions; however, many of its uses are yet to be scientifically validated.